Zara Davis managed to crack the woman’s speed production record of 36.99 knots (68.5 KM/H) That is some serious speed! She used a Mistral speed board, a Simmer 5.0 SCR 2010 and a Sonntag GPS_5 220 widebase speedfin. 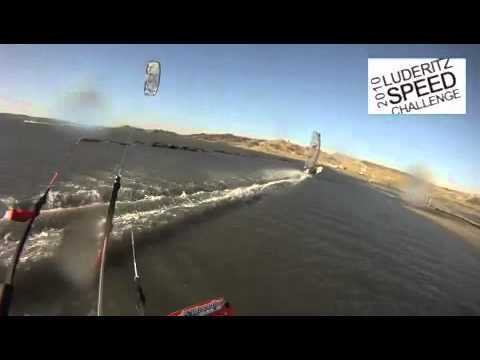 The cannel in Luderitz, Namibia, was not ideal for windsurfing. The approach is very shallow and the sand bank build to reduce the chop also interfered with the wind, making the end of the run not perfect. So Zara Davis managed to get the best out of the spot. This video shows Alex Caizergues in Namibia doing 54.1(!) knots (= 100.2 KM/H, also a new World Record) on the same speed strip. Respect! This is also a cool video which shows the channel from the riders view.